Thursday December 13, 2018-President Uhuru Kenyatta received a thunderous welcome to the lakeside city of Kisumu, the first visit ever since the dramatic handshake with Opposition leader, Raila Odinga. The Head of State had the opportunity to address Kisumu residents through the sunroof of his vehicle as his convoy snaked through the lakeside city to Mamboleo Stadium where he launched the Universal Health Care. In his address, he promised that he would not leave Raila Odinga behind and that the two would work together in building a corruption-free, inclusive Kenya. "I have told my brother Raila that I will not leave him behind." “We will traverse Kenya together and preach unity," Uhuru said amid a rapturous applause. 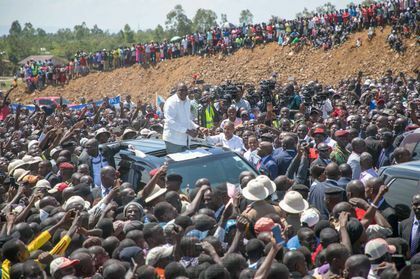 Uhuru said all these in the presence of his Deputy, William Ruto, who is banking on the Kikuyu community to support his 2022 Presidential bid.